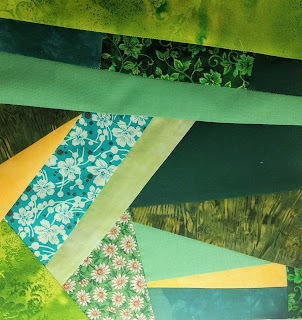 I am making a crazy pieced larger mug mat for a friend. I know that yellow is not a shade of green - but it is a component of green, so I added it anyway. Once upon a time, I told one friend that I didn't like green. Hmmm....that must not be true as I have a lot of it in my stash! As soon as I hear back about the size she prefers I will either trim it or add borders and it will be ready to layer and quilt. Ooooh! Pretty! My favorite color. A quick and fun project. Those fabrics are nice together.